Computers & Operations Research now incorporates Surveys in Operations Research and Management Science. COR will therefore also publish state-of-the-art surveys and best practice guides in analytics, operations research, and management science, in a special Surveys section. These reviews of leading research in the field enable educators, researchers and students to obtain an overview of subjects of current interest, as well as important recent developments in established areas. Submissions can focus on theory or applications of OR/MS, and can be of several types, including but not limited to: (i) Results that are considered standards by experts in the community but which have not been documented in textbooks; (ii) Standard results which have been, in some way, streamlined such as, for example, new proof techniques leading to more elegant derivations of known results; (iii) New developments in methodology, or new application areas ('hot topics'). A review should be critical with respect to the existing knowledge and should focus on the computational and algorithmic aspects/developments. For more information on writing a contribution for the Surveys section of COR, please refer to What Makes a Good Survey? 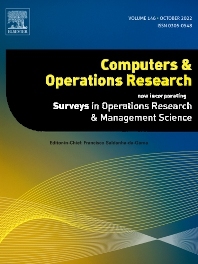 Computers & Operations Research also publishes focused issues on topics of interest related to its editorial mission. Such issues typically contain between six and twelve articles. They are put together within an eighteen-month period under the responsibility of one or several guest editors. Prospective guest editors are encouraged to contact the Editor-in-Chief. It is the responsibility of the authors to ensure that the submitted manuscripts are written using proper English, that possible grammatical or spelling errors are eliminated and that the text conforms to correct scientific English. Submissions which do not satisfy these criteria may be rejected without being sent to reviewers.